When you immerse yourself in a topic – discussing, thinking, and writing about it over a period of years – you can’t help but lose the beginner’s perspective. You take for granted the conventions and jargon used commonly by those “on the inside” with you, only to be brought up short when a newcomer asks you exactly what you mean when you use that word. The film festival world is no different. Often it’s worse, since every festival invents its own way of doing things and some words (like “screener”) have multiple meanings. That’s why this article exists -- it assumes very little knowledge about what film festivals are or how they work. If you’re just getting started on your festival journey, it’s a good overview of the festival year and the what, how, and why of festivals in general. One of the most useful weapons in an independent filmmaker's arsenal is a general understanding of the way film festivals work. Few things will gain you more favor in the eyes of a festival director than a familiarity with the annual cycle most festivals go through and your attention to detail when it comes to the peculiarities of that festival. The less time you spend asking questions whose answers are readily available on the festival web site and the more you present yourself as an easygoing soul who is happy to make the festival's job as trouble-free as possible, the smoother the entire process will be for all involved. This is not to say that you should surrender all dignity at the festival door, but the books of festival lore are replete with stories of filmmakers who pestered festival staff with inane queries, displayed a sense of entitlement when their film was accepted, and then complained about the experience afterward. Those stories rarely end with the festival programming that filmmaker's next picture. A little knowledge and a bit of graciousness go a long way. From the perspective of a filmmaker, the festival process begins with the call for entries. In reality there often have been months of preparation leading up to the call -- analysis of the previous festival's successes and failures, reworking of the festival procedures and format, the courting of sponsors, and more. The period between the end of one year's festival and the call for entries of the next is also when staff turnover is likeliest. If you're submitting to a festival for the second (or third or fourth) time, be mindful of the fact that the relationships you established with last year's staff may need to be rebuilt with someone new. By the time they put out the call for entries, this year's staff has already put a lot of thought and work into the upcoming event. Filmmakers responding to the call for entries fill out the festival's submission form, pay a submission fee (at this writing, anywhere from $20 - $50 and sometimes more), and send one or more copies of their film to the festival for consideration. Festivals play up-and-coming films headed for theaters, yes, but they also depend on submissions from relative unknowns to provide the new, the original, the unexpected. This is what makes film festivals special: they’re willing to watch a movie from anyone (so long as they submit according to the rules). If that movie strikes a chord with the programming team, a filmmaker can very quickly rise from obscurity to a place of renown on the platform provided by the festival. As the entries come into the festival, they are sorted by category and catalogued for review. The screening process usually begins as soon as the first films start to trickle in and really gets going as the deadlines approach. Depending on the size of the festival staff and the volume of submissions every film may be viewed by either a staff member or a team of screeners (usually volunteers) may be employed. Each film is viewed by one or more of these screeners (the better festivals make sure each film is viewed at least twice) and evaluated by a standard set of criteria. As the festival dates draw near, the programming team sets aside the best-reviewed films for deliberation and after much internal agonizing, lobbying, and the occasional cage match final decisions are made. Once the festival decides which films to show the programming team notifies each filmmaker of their acceptance or rejection. As with so many other things in life, the happy news for those films accepted is often delivered first and by personal contact; rejections are usually sent en masse and by form letter. With a program set, the festival staff locks down screening times and puts the finishing touches on the thousands of details that go into a film festival: venues, travel arrangements, the technicalities of projection, print trafficking, party logistics, transportation, the creation of printed and online program guides, volunteers, ticketing, marketing, catering, media relations, and more. Film festivals have branched out from the mere exhibition of movies, offering a bewildering array of parties, panels, speakers, trade shows, seminars, concerts, live animal acts, and other associated events at a multitude of venues. The larger festivals often have a halo of unofficial proceedings during the event, organized by companies and individuals looking to capitalize on the festival's prestige -- and of course the influx of moviegoers and filmmakers. In the weeks leading up to the festival, the festival staff and filmmakers ramp up their marketing efforts, publishing press releases and sending screeners to local and industry media. Larger festivals often receive preview and on-site coverage from industry publications, but even small festivals will get some coverage from the local press. At this point it's all about selling tickets and putting butts in seats, so the marketing department works overtime to promote the festival program. Savvy filmmakers will start their own marketing campaigns in the festival city, distributing posters and handbills at establishments near the festival venue and seeking coverage from community media to lure film fans to their screenings. This is often the most nerve-wracking time for both filmmakers and festival staff -- making sure everything is going to go off without a hitch (it rarely does) and hollering at the top of their metaphorical and actual lungs to be heard in a world whose collective attention is perpetually fleeting. Eventually those final days tick down, however, and it's time for the opening night curtain. (Though sadly, few are the festivals fortunate enough to host their opening nights at theaters which employ actual curtains.) Filmmakers fly in with their marketing materials in hand, business cards in their pockets, and stars in their eyes. And why shouldn't they? Years of work led up to this moment, little of it glamorous, and for many of these no-longer-aspiring cast and crew-members, this is the first significant recognition of the merit of their work from someone other than their family and friends. This is the point at which filmmaker expectations of a film festival meet reality and disappointment is bound to occur. Relatively few films actually play the well-funded festivals that can afford to fly their contestants in and put them up in lavish hotels; even fewer have the cachet to sell out every film they program. The anticipation of a world premiere with a packed house and an smiling acquisition exec in the crowd, checkbook at the ready, collides with the truth: audiences can be maddeningly elusive, acquisition execs even more so, and film festivals are filled with filmmakers just like you -- hungry, talented, and willing to work, but playing in an ever more crowded field. This is not to say that film festivals aren't worth your time. Quite the opposite! In the case of many independent films, festivals act as a de facto theatrical tour for those films not destined to achieve theatrical distribution. Film festivals are also the front lines of quality control on the massive glut of independent movies made each year. Without the teams of film festival screeners wading through the sub-standard pictures and heralding the gems that appear, distributors and audiences would have an even harder time finding those unknown filmmakers whose work deserves to be seen. Filmmakers benefit from the festival process even more than the audiences. Not only do they get to see the amazing work of their peers, but they also have a place to showcase their own movies, find their audiences, garner publicity, and – every so often – get a real lead on some financial remuneration for their work. As the festival event draws to a close, the audiences and filmmakers disperse, returning home with new contacts, new friends, and new favorite films. The members of the festival staff pack up their venues and temporary workspaces, prepares their post-event reports, and fall in bed to sleep for a week. 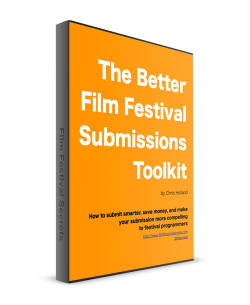 Now that you know how the festival year works, tune up your film’s submissions packet with the free Better Film Festival Submissions Toolkit. Get the insight you need to better understand what programmers look for and how to submit with confidence.